Florida is home to a multitude of waterways, in addition to having the longest coastline in the contiguous U.S. The Sunshine State is the perfect place for recreational activities and for boat/RV storage. If you are considering making changes to add boat/RV storage to your existing self-storage facility, the following information could help. The U.S. boating industry recently reached a 10-year high in sales, according to the 2017 statistical report from National Marine Manufacturers Association (NMMA). The need for boat storage is strongly projected to continue growing in 2019, as well. Boat and RV owners often find it very difficult to find a boat/RV storage facility with space to accommodate them. This can be great news for owners of existing self-storage facilities in Florida. Storage for boats and RVs is in greater demand than ever. Less than Ideal Location? Not a Problem! Because demand typically outpaces supply for boat/RV storage in places like Florida, tenants are willing to travel further than they would for basic storage items. While assessing the market for your self-storage property, remember that having a convenient location isn’t a qualifying factor for boat and RV storage. Find out how many self-storage facilities near you offer the service, and weigh it against proximity to the Gulf, ocean, a lake, or a popular camping area. The cost of modifying your property could be tailored to fit your budget. 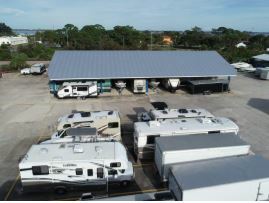 The three basic types of RV and boat storage are: Parking lot spaces; storage under a canopy; and fully enclosed units. All you may need to do for the most economical boat and RV storage is repaint a portion of your existing parking lot and add numbers to designate rental spots. Otherwise, you could pave any additional land you may have available on your self-storage property. There are different variables to be considered for canopy storage. You could offer a roof only or a roof and a wall on one, two, or three sides. The height of the canopy should provide clearance needed for luxurious vessels and RVs. Statistics show that the ability to keep boat/RV canopy spaces filled is virtually guaranteed. Providing fully enclosed units for boats and RVs is best if you cater to customers expecting high-end accommodations. The units must have high clearance, doors that roll up, unit alarms, and reliable locks. If your facility is located where drivers frequently share the road with extravagant RVs and boats, keeping the added units occupied is virtually guaranteed. Additional space for driving may need to be added, with at least 35-foot-wide aisles needed to accommodate fifth-wheel trailers and spacious motorhomes. The extra driving space protects your property while improving tenants’ experience at your self-storage. You may also need to enhance security measures to include gated access, security cameras, high fences, and staff members helping to keep careful watch over the boats and RVs. Fifth-wheel trailers are the most susceptible to theft; you may want to offer locks for sale especially made for fifth-wheel trailers. Weaver Realty Group provides excellent self-storage brokerage services for the entire Florida peninsula. A local company, Weaver is an Argus Affiliate, which means it’s a partnership that offers tremendous benefits. Learn more by contacting Josh Koerner, Weaver Realty Group, at (904) 591-0140.